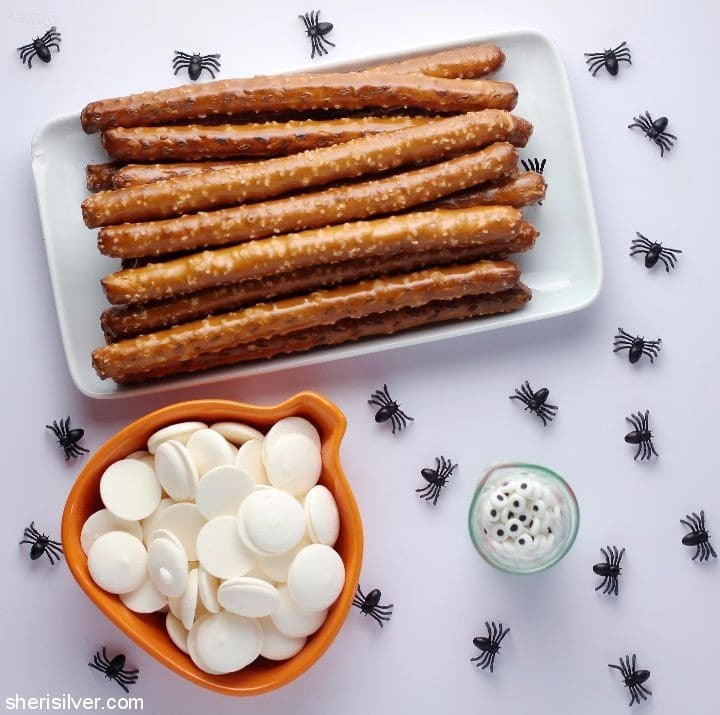 So I have a lot of candy eyes lying around…..
What, with the Oreos, bark, muddy buddies and – well – eyeballs, they’re kind of a thing around here. 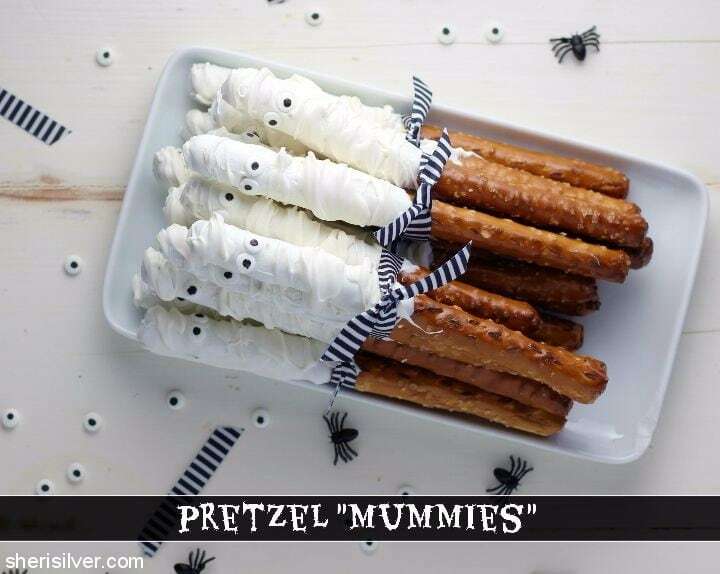 And in looking for a sweet-salty, SUPER easy and fast treat, I decided on some pretzel mummies! Just 3 ingredients – THREE! 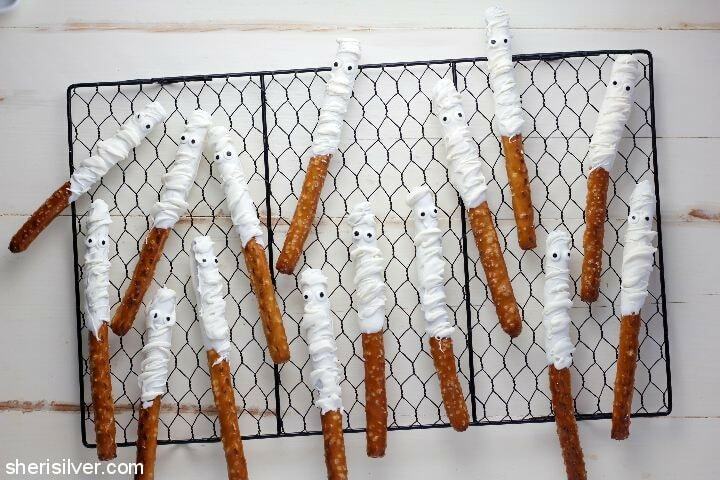 – to create these adorably spooky (and kind of delish) snacks for school celebrations and Halloween goody bags. I mean, you have 10 minutes, right? Because that’s how long it takes to get these babies dipped, “eyed” and drizzled – and back in the fridge – leaving you to all the apple picking/hay riding/football watching you really want to get to this season. Line a baking sheet with parchment or wax paper. Melt the chocolate in the top half of a double boiler set over barely simmering water. Working with one pretzel at a time, dip halfway into the melted chocolate, allowing any excess to drip back into the bowl. Place on your baking sheet and add 2 candy eyes toward the top. Repeat with remaining pretzels; place in the fridge for 15 minutes. 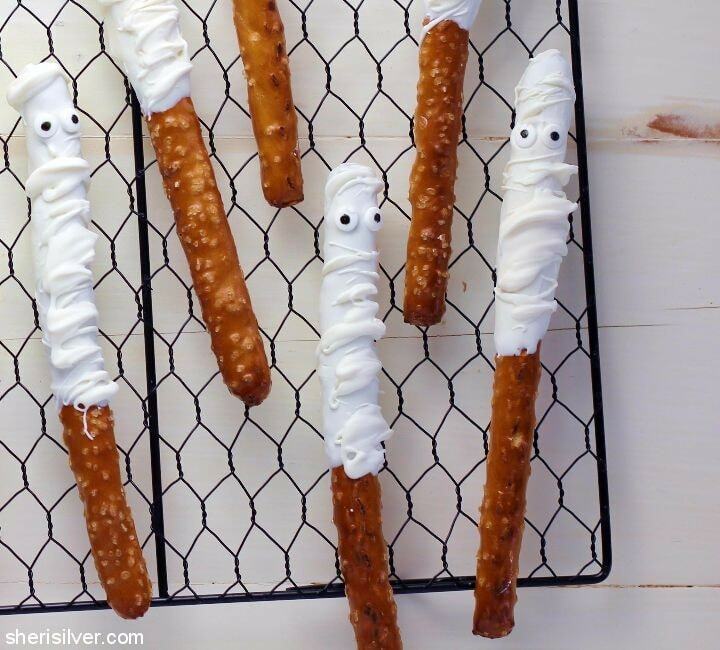 Dip a fork into the remaining melted chocolate and drizzle over the dipped pretzels (avoiding the eyes) to create a “mummy” effect. If the chocolate is too thick to drizzle, add a small amount of vegetable oil – a bit at a time – to thin it out to the desired consistency. Return to fridge to set. More Halloween fun on my Pinterest board!